A belated TGIF y'all from rainy Atlanta. Well, it was actually only rainy this morning. 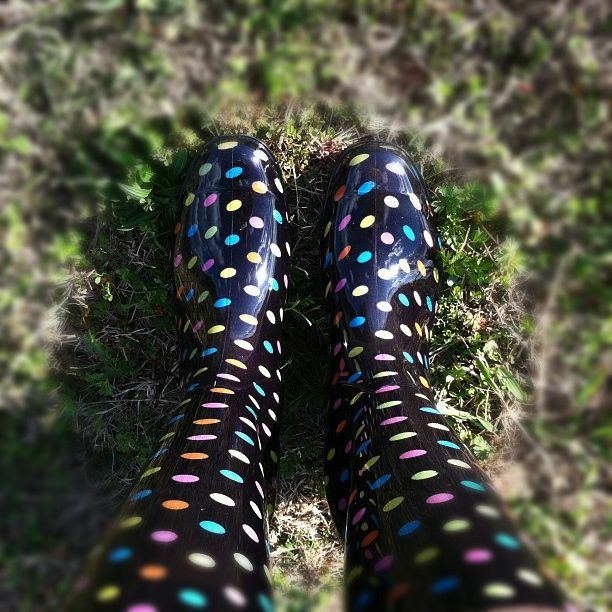 However, with our already drought-like conditions, I pulled on the old polka-dot rain boots and splashed a bit. Just a bit because that's all we got. A bit. But hey, I'm not complaining. Who will love Sophie and Oreo while I'm gone, you ask? Why my fantastically capable house-sitters, that's who. They will be sufficiently spoiled and loved the entire time. You know why I didn't TGIF until late Friday night??? Because I was busier than a one armed paper hanger. So have a wonderful Saturday. Enjoy yourself while you're NOT thinking that I'm driving 4.5 hours then waking up and driving another 7 hours. No, don't think about that at all. I certainly won't because I'll see people I love and, yes, it is worth it. Yes. Yes, it certainly is. I love your boots! I hope that everything goes well this weekend.